"Ilithyia" redirects here. For the former snout moth genus, see Aphomia. Eileithyia or Ilithyia (/ɪlɪˈθaɪ.ə/; Greek: Εἰλείθυια;,Ἐλεύθυια (Eleuthyia) in Crete, also Ἐλευθία (Eleuthia) or Ἐλυσία (Elysia) in Laconia and Messene, and Ἐλευθώ (Eleuthō) in literature) was the Greek goddess of childbirth and midwifery. In the cave of Amnisos (Crete) she was related with the annual birth of the divine child, and her cult is connected with Enesidaon (the earth shaker), who was the chthonic aspect of the god Poseidon. It is possible that her cult is related with the cult of Eleusis. In his Seventh Nemean Ode, Pindar refers to her as the maid to or seated beside the Moirai (Fates) and responsible for creating offspring. The earliest form of the name is the Mycenaean Greek 𐀁𐀩𐀄𐀴𐀊, e-re-u-ti-ja, written in the Linear B syllabic script. Ilithyia is the latinisation of Εἰλείθυια. Eleithuia, seated beside the deep-thinking Fates, hear me, creator of offspring, child of Hera great in strength. who bringest relief in labour's dreadful hour. —  Orphic Hymn 2, to Prothyraeia, as translated by Thomas Taylor, 1792. Thus Aelian in the 3rd century AD could refer to "Artemis of the child-bed" (On Animals 7.15). The Beauty of Durrës, a large 4th-century B.C.E. mosaic showing the head figure of a woman, probably portrays the goddess Eileithyia. 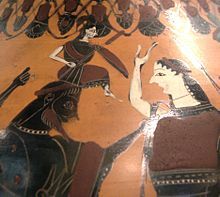 Vase-painters, when illustrating the birth of Athena from Zeus' head, may show two assisting Eileithyiai, with their hands raised in the epiphany gesture. As the primary goddess of childbirth along with Artemis, Eileithyia had numerous shrines in many locations in Greece dating from Neolithic to Roman times, indicating that she was extremely important to pregnant women and their families. People would pray for and leave offerings for aid in fertility, safe childbirth, or thanks for a successful birth. Archeological evidence of terracotta votives figurines depicting children found at shines and holy sites dedicated to Eileithyia suggest that she was a kourotrophic divinity, whom parents would have prayed to for protection and care of their children. Midwives had an essential role in ancient Greek society with women of all classes were midwives participating in the profession, with many being slaves with only empirical training or some theoretical training in obstetrics and gynecology. More highly educated midwives, typically from higher classes, were referred to as iatrenes or doctors of women’s diseases and would be respected as physicians. "Even so again, Eileithyia, come thou when Kykainis calls, to bless her pains with easy birth; so may thy fragrant shrine have, as now this offering for a girl, some other offering hereafter for a boy." Her Egyptian counterpart is Tawaret. She was strongly connected with the goddesses Artemis and Hekate, the latter of whom she shared strong chthonic elements to her cult. There were ancient icons of Eileithyia at Athens, one said to have been brought from Crete, according to Pausanias, who mentioned shrines to Eileithyia in Tegea and Argos, with an extremely important shrine in Aigion. Eileithyia, along with Artemis and Persephone, is often shown carrying torches to bring children out of darkness and into light: in Roman mythology her counterpart in easing labor is Lucina ("of the light"). The Cave of Eileithyia near Amnisos, the harbor of Knossos, mentioned in the Odyssey (xix.198) in connection with her cult, was accounted the birthplace of Eileithyia. The Cretan cave has stalactites suggestive of the goddess' double form (Kerenyi 1976 fig. 6), of bringing labor on and of delaying it, and votive offerings to her have been found establishing the continuity of her cult from Neolithic times, with a revival as late as the Roman period. Here she was probably being worshipped before Zeus arrived in the Aegean, but certainly in Minoan–Mycenaean times (Burkert 1985 p 171; Nilsson 1950:53). The goddess is mentioned as Eleuthia in a Linear B fragment from Knossos, where it is stated that her temple is given an amphora of honey. In the cave of Amnisos (Crete) the god Enesidaon (the "earth shaker", who is the chthonic Poseidon) is related with the cult of Eileithyia. She was related with the annual birth of the divine child. The goddess of nature and her companion survived in the Eleusinian cult, where the following words were uttered: "Mighty Potnia bore a strong son." In classical times, there were shrines to Eileithyia in the Cretan cities of Lato and Eleutherna and a sacred cave at Inatos. At a sanctuary in Tsoutsouros Inatos, two small terracotta figures, one breastfeeding and the other pregnant, have been dated to the 7th century. According to the Homeric Hymn III to Delian Apollo, Hera detained Eileithyia, who was coming from the Hyperboreans in the far north, to prevent Leto from going into labor with Artemis and Apollo, because the father was Zeus. Hera was very jealous of Zeus's relations with others and went out of her way to make the women suffer. The other goddesses present at the birthing on Delos sent Iris to bring her. As she stepped upon the island, the birth began. This hymn is contradicted by Hesiod’s Theogony, where Apollo and Artemis are born before Hera's marriage to Zeus, and therefore neither Hera or Eileithyia are mentioned interfering with the birth of the twins. On Delos, Eileithyia had a shrine and was worshipped in a mid-winter festival the named Eileithyaea. It was said by Callimachus that the hymn sung during festival was the same as that sung by nymphs at Apollo's birth. This cult likely goes back to at least the Archaic period, and the cult was associated with other local Delian childbirth deities associated with Artemis, Opis and Arge. Eileithyia had a cult south of the Mount Kounados on the Cycladic Island of Paros, where a cave with a natural spring functioned as an informal sanctuary. Numerous artifacts have been found, such as pottery, bronze pieces, and marble plaques, which indicate use of the site from the Geometric period to the Roman period. It has been theorized that the site was used for prayers for both female and male fertility, based on the type of offerings that have been found. On the Greek mainland, at Olympia, an archaic shrine with an inner cella sacred to the serpent-savior of the city (Sosipolis) and to Eileithyia was seen by the traveller Pausanias in the 2nd century AD (Greece vi.20.1–3); in it, a virgin-priestess cared for a serpent that was "fed" on honeyed barley-cakes and water—an offering suited to Demeter. The shrine memorialized the appearance of a crone with a babe in arms, at a crucial moment when Elians were threatened by forces from Arcadia. The child, placed on the ground between the contending forces, changed into a serpent, driving the Arcadians away in flight, before it disappeared into the hill. Archaeologists uncovered a sanctuary dedicated to Eileithyia at Eretria. The sanctuary had been placed in the northwestern section of a gymnasium. There was a sanctuary dedicated to Eileithyia near the Sanctuary of Artemis Orthia. ^ Joseph Emerson Worcester, A comprehensive dictionary of the English language, Boston, 1871, p. 480, rule 3, where he notes the word has four syllables as in Greek and Latin, "not I-lith-y-i'-a as in Walker" (e.g. Walker and Trollope, A key to the classical pronunciation etc., London, 1830, p. 123). ^ "The Linear B word e-re-u-ti-ja". Palaeolexicon. Word study tool of Ancient languages. Raymoure, K.A. "e-re-u-ti-ja". Minoan Linear A & Mycenaean Linear B. Deaditerranean. ^ R. S. P. Beekes, Etymological Dictionary of Greek, Brill, 2009, p. 383. ^ "Cretan dialect 'Eleuthia' would connect Eileithyia (or perhaps the goddess "Eleutheria") to Eleusis". Willets, p. 222. ^ Homer, Iliad 16.187, 19.103. ^ Homer, Iliad 11.270, The plural is also used at Iliad 19.119. ^ a b c Dillon, Matthew (2002). Girls and Women in Classical Greek Religion. Milton Park, Oxfordshire: Routledge. p. 230. ^ a b c d e Wise, Susan (2007). Childbirth Votives and Rituals in Ancient Greece (PhD). University of Cincinnati. ^ a b Tsoucalas, G.; Karamanou, M.; Sgantzos, M. (2014). "Midwifery in ancient Greece, midwife or gynaecologist-obstetrician?". Journal of Obstetrics and Gynaecology. 34: 547. ^ For the proceedings and findings of the archaeology, see Amnisos. ^ a b Robertson, N. (1974). "Greek Ritual Begging in Aid of Women's Fertility and Childbirth". Transactions of the American Philological Association. 113: 143–169. doi:10.2307/284008. JSTOR 284008. ^ MacLachlan, B (2009). "Ritual and the Performance of Identity: Women and Gender in the Ancient World". Journal of Women's History. 23: 176–186. Beekes, R. S. P., Etymological Dictionary of Greek, Brill, 2009. Burkert, Walter, Greek Religion, 1985. Homer, The Iliad with an English Translation by A. T. Murray, Ph.D., in two volumes. Cambridge, Massachusetts., Harvard University Press; London, William Heinemann, Ltd. 1924. Online version at the Perseus Digital Library. Homer; The Odyssey with an English Translation by A. T. Murray, Ph.D., in two volumes. Cambridge, Massachusetts., Harvard University Press; London, William Heinemann, Ltd. 1919. Online version at the Perseus Digital Library. Nilsson, Martin P. (1927) 1950. The Minoan-Mycenaean Religion and Its Survival in Greek Religion 2nd ed. (Lund"Gleerup). Pausanias, Pausanias Description of Greece with an English Translation by W.H.S. Jones, Litt.D., and H. A. Ormerod, M.A., in 4 Volumes. Cambridge, Massachusetts, Harvard University Press; London, William Heinemann Ltd. 1918. Online version at the Perseus Digital Library. Willetts, R. F. "Cretan Eileithyia" The Classical Quarterly New Series, 8.3/4 (November 1958), pp. 221–223.